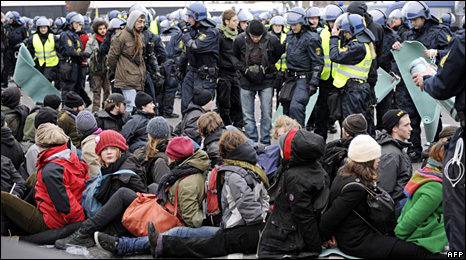 Climate change groups have criticised Danish police for using heavy-handed tactics after they detained 968 people at a rally near the Copenhagen summit. Mel Evans from Climate Justice Action told the BBC protesters were held for hours in freezing conditions without medical attention, water or toilets. Police say almost all of those detained on Saturday have now been released. But another march pressing for action on global warming near the harbour on Sunday saw dozens more people arrested. Riot police stopped the unauthorised demonstration outside the Oesterport station and carried out security checks on participants. Police spokesman Flemming Steen Munch told the Associated Press that bolt-cutters and gas masks had been found inside a lorry at the front of the march, and that 200 activists had been detained. Meanwhile, environment ministers have been arriving to join other delegates at the UN summit, which runs for another week. More than 40 ministers are attending informal talks at Denmark's foreign ministry. Documents prepared by leaders of the conference call on developed nations to cut greenhouse gas emissions by between 25% and 45% of 1990 levels by 2020. Developed countries to "set a goal of mobilising jointly $100bn a year by 2020 to address the needs of developing countries"
On Saturday, the EU joined the US in criticising a draft agreement that says developing nations will only reduce their emissions if they receive financial help. The EU has offered developing nations a 7.2bn-euro (£6.5bn; $10.6bn) three-year deal. "There has been a growing understanding that there must be commitments to actions by emerging economies as well," said Swedish Environment Minister Andreas Carlgren, whose country holds the EU's rotating presidency. The exact target for limiting temperature rise is unclear amid disputes between various blocs. The UN-sponsored Intergovernmental Panel on Climate Changes (IPCC) wants to keep the rise to below 2C (3.6F) above pre-industrial levels. Speaking on arrival in Copenhagen, UN Secretary General Ban Ki-moon said he was "cautiously optimistic" about the outcome of the summit. The fact that "ministers and heads of state are gathering is a good indication that some important messages will be sent to everybody", he told the AFP news agency. Police said about 30,000 people took part in Saturday's demonstration in the Danish capital, although organisers put the number at 100,000. Many chanted and carried banners reading "Demand climate justice", "The world wants a real deal" and "There is no Planet B". The protest was mainly peaceful, but some protesters threw bricks and smashed windows in the city centre, while others set off fireworks. Large numbers of mainly young people were later detained. 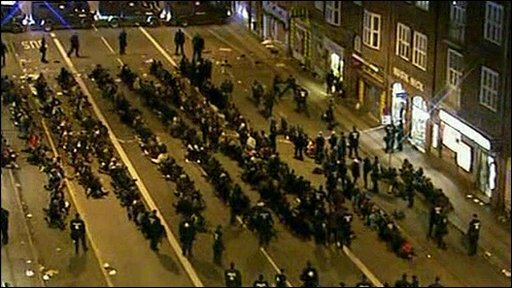 TV pictures showed the police putting the demonstrators in seated lines on the street with their hands tied behind their backs. They were later removed on buses. Ms Evans said the actions of the police were appalling. "People were very scared and they were held for about four hours on the ground. They weren't able to have any medical attention, any water, and weren't allowed to have any toilet facilities," she told BBC Five Live. "People were there in freezing conditions urinating on themselves and being held in lines like, essentially like animals." The World Development Movement's director, Deborah Doane, condemned the authorities for what she said was a "complete violation of the right to protest and a step towards the breakdown of democracy". In a statement, Copenhagen police said a large group of protesters had organised themselves in a so-called "black bloc", in which they put on masks - an illegal action at a demonstration in Denmark. Officers then decided to "seal off" the group from the march. The force said the large number of arrests had "produced a huge amount of pressure" on officers responsible for transporting, receiving and registering detainees. "This [meant] a large number of detainees got to sit disproportionately long on the street before transportation was possible. Copenhagen Police will evaluate if there is an opportunity for a faster way of transporting detainees away from the scene in the future," it added. On Sunday, police said only 13 of the people detained remained in custody, three of whom - two Danes and a Frenchman - would soon appear in court on preliminary charges of fighting with police, according to the Associated Press news agency.